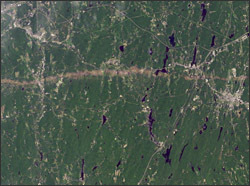 Landsat 5 image near Sturbridge, MA. Credit: NASA EO/Jesse Allen/USGS, using Landsat 5 data provided by Julia Barsi of the Landsat Project Science Office. On June 1, 2011, a supercell thunderstorm developed over western Massachusetts. The storm produced an EF3 tornado that cut a 39-mile (63-kilometer) track of destruction across southwest and south-central Massachusetts. Not only did the long-lived tornado remain on the ground for many miles, but it also widened to 0.5 miles (0.8 kilometers). The Thematic Mapper on the Landsat 5 satellite captured this natural-color image on June 5, 2011. This image shows part of the tornado track, including damage in Sturbridge. According to the Boston Globe, Massachusetts state police reported a tornado on the ground in Sturbridge at 5:22 p.m. The tornado was spotted on the Interstate 84 exit, and cars were overturned. The Boston Globe reported that the Massachusetts governor declared a state of emergency and ordered National Guard troops to assist with cleanup efforts. Tornadoes on June 1 killed at least four residents of the state, as well as reducing homes, schools, and churches to rubble.